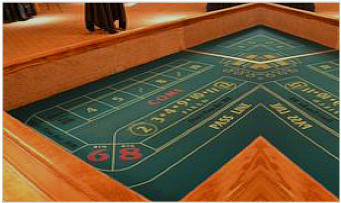 Casino Details: The club owns over 47 pieces of casino equipment. Only chips provided by the club may be used. Uniformed volunteer members operate all of the games. Parties are run continuously for the time agreed upon. All equipment is delivered, setup, and removed by the club. NO MONEY may be wagered during the games. The “Pit Boss” assigned to a party works directly with the clients representative in managing each party. House rules are reviewed with the client before the games begin. Dealers are available to teach games to players. The club will furnish a written contract. The client and the club manager must sign it. Copies are provided. to request a contract quote click here or call 317-767-4640. You may also write the club at PO Box 40053 Indianapolis, Indiana, 46240, or email to: Ken Fluharty at: Funds paid for the parties, except for transportation & maintenance are distributed to selected charitable organizations. 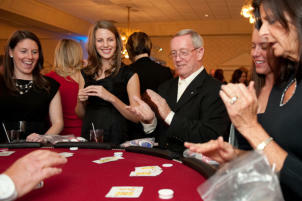 The casino parties produced by the Broad Ripple Sertoma Club are for entertainment only. The club will not be a party to any violation of the Gaming Rules of the State of Indiana. Money wagers are not allowed.